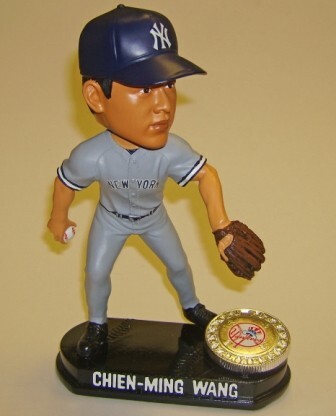 Forever Collectibles presents this player bobble of one of the most popular Major Leaguers right now: Chien-Ming Wang. Already a national sensation in his home country of Taiwan, Wang became the Yankees' ace after having a solid year in 2006. This bobblehead figurine features him in his Yankees road gray uniform, and will make an excellent addition to any collection!